Es gibt hervorragende Nachrichten für Fans der US-Thrasher Sacred Reich: Die Band um Sänger und Bassist Phil Rind arbeitet am Nachfolger ihres letzten Studioalbums "Heal", das vor 23(!!!) Jahren erschien. ": "Wir sind mitten in den Aufnahmen für unser neues Album mit Produzent Arthur Rizk im The Platinum Underground Studio hier in Arizona", verrät Rind. Der Titel des Werkes, das im Sommer erscheinen soll ist bereits bekannt und passend gewählt: "Awakening". 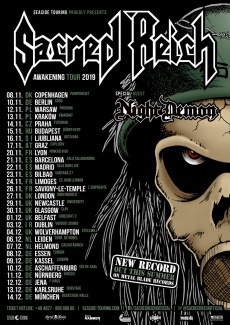 Unter diesem Motto gehen Sacred Reich auch auf Tour. Register now your email address and never miss events, dates and news for SACRED REICH. Sacred Reich is a Phoenix, Arizona-based thrash metal band that formed in 1985. Singer/songwriter Phil Rinds interest was in socially conscious and political speed metal. After several records on Metal Blade Records, they signed to Hollywood Records for a short stint, but later returned to Metal Blade to continue their musical career. The band split in 2000. Former drummer Dave McClain went on to join Machine Head in 1995. Lead guitarist Wiley Arnett went on to form The Human Condition with St. Madness vocalist Prophet in July 2000. In 2007, the band reunited to play several shows in Europe, including Wacken Open Air. 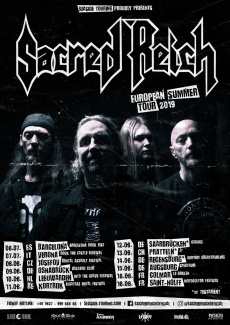 However, according to an interview with bassist/vocalist Phil Rind, there are no plans to record a new Sacred Reich album.